l Ball level…on uneven surface, adjust the ball level locking knob to balance the head. l Tilt…Release tilt locking knob, and move the head up or down to tilt. Retighten the tilt lock. l Pan… Release the pan lock and move the head left or right to pan. l Lock Legs… The legs can be held together by fixing the transport clip. 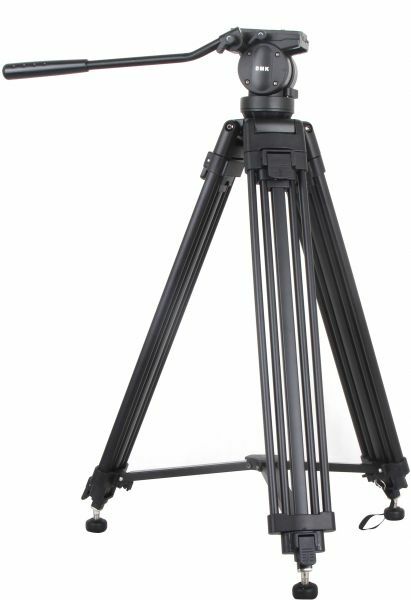 l Retractable Spiked Feet… This video tripod offer screw in rubber feet and stainless steel spiked feet. l Tilt Bar… The tilt bar can be installed on the left or right by releasing the knob. l Leg length adjustment… Release flip-locks and extend the legs to desired height and retighten the flip-locks. l Mid-level Spreader… To spread the tripod the full extension of the mid-level spreader.